For solid power metal fans, Tobias Sammet’s ambitious pursuit otherwise known as AVANTASIA might just be the best thing that ever happened in their beloved genre of magic and fantasy. With this project launched by EDGUY’s charismatic vocalist, we have witnessed several extremely talented and some of the most prominent rock and metal vocalists collaborate together and create enchanted pieces of music. We have heard different beautiful voices from different fields of music jam together in the form of power metal. With the company of equally talented musicians, we have seen tremendous and magical live performances. Thanks to hellfire Tobi and his metal opera. While AVANTASIA has a set of consistent contributors for their previous releases, the lineup of guest singers in this new album includes three new voices including Blind Guardian’s Hansi Kürsch, Kreator’s Mille Petrozza and Ritchie Blackmore’s life partner and Blackmore Night’s vocalist Candice Night. First and foremost, I’d like to take a moment mentioning how I loved the album artwork the first time I saw it. Its wonderful enigma could easily captivate anyone at first sight, even those who are not a fan of this kind of music. But upon hearing the album, this beautiful piece of art created by Alexander Jansson became more meaningful to me. By simply having a glance at it, what you’ll see is a monochrome of blue and green with a silhouette of a girl who appears to be standing in the middle of the woods at night. But if you intend to have a closer and a more keen observation, you will see all its details revealing itself to you one by one. While generally dark tinted, you will see that in the middle of it is a very a colorful and lively space. The starry sky accompanied by the purple lavenders on a wide green field is such a beautiful and peaceful sight. However, there are certain entities which seem to bear cryptic messages that surround this sight. This darkness freely lurks around the silhouette that does not seem to be aware of it. Why is this relevant to the review, you ask? Because this artwork is the visual representation of what lies within the album: it’s colorful but dark, it has a glorious atmosphere with a touch of darkness, and more than just music, it’s a really magnificent piece of art. The opener of this album is different, as majority of AVANTASIA’s albums begin with an instrumental prologue. This time, “Ghost in the Moon” opens with Tobi’s chanting accompanied by a minimalist rendering of the keyboards. The energy then gradually builds up and launches a roller coaster of musical wonder and reveals a monumental hymn of a chorus with such smooth transitions guided by Sascha’s amazing solos and blazing riffs. The song really reaches its peak at the chorus sang by Tobi backed by an epic choir in a very triumphant tune. The ten-minute song doesn’t have a vacant part that would leave the listener bored, may he be a long time AVANTASIA fan or a non-metalhead. Talking about diversity, listen to “Book of Shallows” and you’ll get exactly what you want. Generally progressive in nature, the song compresses different kind of atmosphere in a five-minute display of virtuosity. This song for me is the most epic entry of the eleven tracks, for in this song we hear Tobias Sammet, Hansi Kursch, Ronnie Atkins and Jorne Lande singing together in a very triumphant mood. The song gets tons heavier in the later half, and then KREATOR’s Mille Petrozza comes in with his ever pissed-off barks like a beast on the loose looking to compromise the council of the gods. The timing of Mille’s insertion is perfect, and the energy that he brought upon his entry was carried over until the final notes of the song. The shortest song in the album, “Invincible” is a power ballad that features Geoff Tate. His singing would instantly remind you how he executed QUEENSRYCHE's “Silent Lucidity” even though this song is higher-pitched. Even with its slow tempo, the song doesn’t seem to be out-of-place (compared to the rest of the songs). And that is because of how spirited the duet is, and how the keyboards provided gilded mellow notes on the background. The song also served as a transition to the faster “Alchemy” still featuring Geoff Tate. Here they once again showed that they can get progressive when time calls for it. The song also contains one of the most memorable riffs in the album. One of the songs I loved most in this album is the title track. It is a beautiful duet between Tobi and Candice Night, one of the newest AVANTASIA contributors. The duet is a simple semi-mellow rock song, but what really carries it is the beautiful and catchy tune driven to life by Tobi and Candice’s wonderful voices that really complements each other and creates a perfect harmony. With its beauty by simplicity, “Moonglow” is one of the most memorable tracks in the album – memorable in a way that the chorus and the melodies created by the keys and guitars will stick in your memory in just one listen. Among all the golden tracks, the first single “The Raven Child” shines the most. Not every band could have the audacity of releasing the album’s longest song as a single, but “The Raven Child” effortlessly consumes you 11 minutes without even noticing with the sheer beauty that this song holds. The song is on its pinnacle when Lande, Kursch and Sammet alternately exchanged lines. It’s like hearing the gods bring down wonderful melodies. I have to mention Hansi’s singing in the first part of the song – it’s so soothing and calming. Concluding the story of “Moonglow” is “Requiem for a Dream”, yet another energy-filled track that features Michael Kiske who ruthlessly exhibited his amazing singing prowess right from his first lines and never ever looked back. It’s a strong, monumental finish to the story introduced by “Ghost in the Moon”. 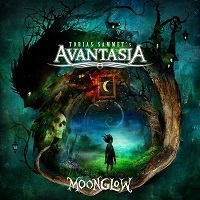 We’ve always known that AVANTASIA is a crossover of Avalon and Fantasia, bit with “Moonglow” and its dark themed story line and brightly composed music, it becomes more like Avalon meets Fantasia meets Tim Burton. What’s more amazing is that the songs interconnect with each other without suffocating in the need to do so. The songs develop by itself in itself with silky smoothness. All of these are made possible by Tobias Sammet’s elegant and sophisticated writing accompanied by a stellar lineup of guest vocalists. Among the instrumentalists, I’d like to make a special shout out Sascha Paeth and Michael Rodenberg for their masterful performances on guitars, keys and orchestrations that served as the heart and soul of each and every track. With this kind of performance, it is easy to say that “Moonglow” is the most diverse, most meticulously detailed album created by AVANTASIA. The whole listening experience is surreal, and you wouldn’t even notice that you already spent 66 minutes gazing in wonder. Listening to the songs is like having a walk at an elegant old-fashioned Parisian art gallery. Like I said in the beginning of this review, more than just music, this album is a magnificent piece of art. I’d like to compare it to a live-size painting where the songs are different characters with different natures, different colors and different appeals. Each of them is carefully detailed to tell exactly what they symbolize, what they portray, and what message they bear. Together, they tell a dark-themed story of wonders which seems to be the beginning of a saga.